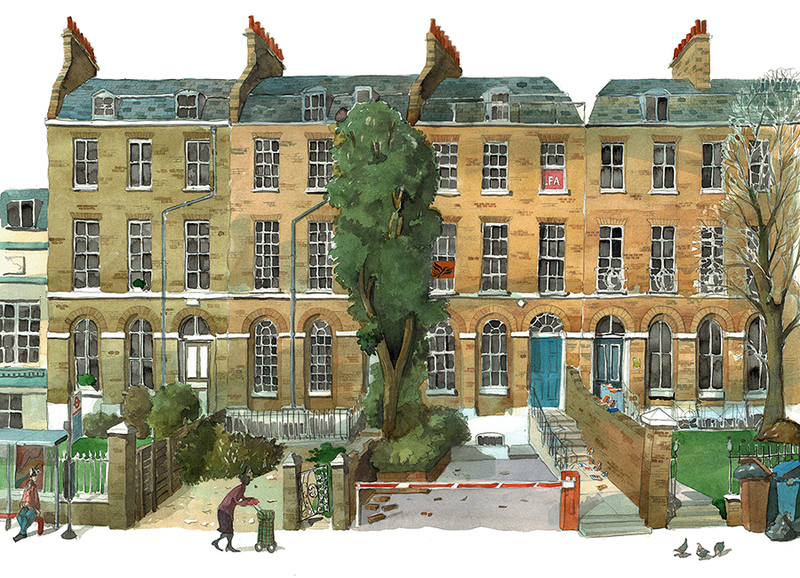 My painting of 80 Camberwell Road, a Grade II-listed Georgian townhouse, is being exhibited as part of the London Festival of Architecture 2017. The London Festival of Architecture was founded in 2004, and is now firmly established as Europe’s biggest annual architecture festival. The London Festival of Architecture 2017, will feature events across the capital from 1-30 June, and this year, will explore the theme of ‘memory’. The London Festival of Architecture celebrates London as a global hub of architectural experimentation, practice and debate, provoking questions about the contemporary and future life of the city, and promoting positive change to its public realm. The London-wide programme is delivered by a diverse mix of architecture and design practices and practitioners, cultural and academic institutions, artists and many others. See the location map and other details on the house here. 80 Camberwell Road, London SE5 0EG is a Grade II-listed Georgian townhouse within a landscape that has changed beyond recognition. For centuries, the road from Southwark to the village of Camberwell was just a track through vegetable fields and pastureland. It was the excavation of the Grand Surrey Canal in 1810, which began a radical process of continuous change. Around 1817, a terrace of ten ‘third rate’ townhouses was built opposite the Canal to house new residents of London’s rapid suburban expansion. Set back from the road, the terrace was originally named Grosvenor Place. It proved a temporary identity. As Camberwell Road became a busy thoroughfare, it absorbed the terrace and the house was re-numbered ‘80’. The terrace’s original name, the architect who designed it and its builders all vanished into obscurity. Further dramatic change followed in 1862, when the rise of the railways literally walled off the townhouses’ back gardens with a viaduct linking Elephant and Castle to the south-east coast. No 80 itself, took almost another century to evolve. It remained a family home until probably the Second World War. And although the house survived the Blitz relatively unscathed, much of its surroundings suffered enough bomb damage to be designated for clearance. It was then, in the immediate post-war decade, that the building changed fundamentally. By the 1960s, rooms originally shaped for domestic life had been turned into offices, a new mansard roof had been added, and a single-storey rear extension would soon follow. The now declining fortunes of the Grand Surrey Canal activated the most ambitious post-war urban redevelopment of any London borough. When the canal finally closed in 1971, it was infilled to form Burgess Park, and the looming, grey monolith of the Aylesbury Estate began to take shape. It was in 1972, possibly in reaction to the London County Council’s sweeping, modern re-imagination of Southwark, that the terrace of ten historic townhouses was listed. Today, both the building and its setting are about to embark on a fundamental regeneration of architectural form, use, identity and significance. Over the next ten years, the Aylesbury Estate will be entirely torn down and swathes of Southwark’s iconic ‘brutalist’ legacy will be comprehensively erased. Soon after this exhibition, 80CR as it is fondly called, will begin a new chapter in its history. We will restore its upper floors into the 19th century townhouse it was originally meant to be, whilst its lower ground level will be entirely redeveloped into our 21st century, purpose-built base for Camberwell & Metropolitan: a new architecture and planning practice, rooted in our neighbourhood with a Londonwide outlook. That’s fascinating. It is a lovely building and most enjoyable to paint. I have passed on your comments onto the owner, he will be thrilled.